Eugen was born in 1994 like a personal free time project, initially writen in Pascal and assembler, in 1995 it was changed to C language. Eugen is partially inspirated in freeware programs like TChess, Gnu, and Crafty. It uses 16 bit attacktables who are setup in every make and unmake move, the search uses iterative deepening, a short recursive nullmove (R=2). In quiescence a selective move generator is activated. Actually node speed evaluations are improved specially for endgame. Little Goliath is a tactical monster due to its search speed and therefore well suited for analysis. The strongest free winboard engine after Crafty. The 2000a and 2000 v.2.0 versions is capable of searching 1.000.000 NPS on fast systems (eg. AMD K6-3 450). A book generator is available at the homepage of Michael Borgstädt. It converts .CBF files (only old chessbase format) to bookformat. A pgn2cb can found in the conversion utilities directory at the archives of the Pittsburgh University chess club (link page). HIARCS searches around an order of magnitude less positions per second (av. 18,000) than most of its competitors. However, it makes up for this apparent slow speed by clever searching and accurate evaluation. HIARCS uses many selective search extension heuristics to guide the search and incorporates a sophisticated tapered search to resolve tactical uncertainties while finding positionally beneficial lines. M-CHESS belongs to the strongest chess programs. 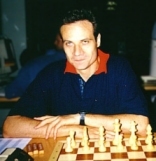 The former NASA programmer Marty Hirsch living in Novato, CA, has been in chess a long time. Legend has it that he decided to create a world champ chess program at the age of seven! And then in 1995 it happened: M-CHESS PRO 5 became world champion in chess software. M-CHESS has, of course, all the necessary features. But Marty's main interest has always been playing strength. The style of his program is more positional. More than 600 000 opening positions are included. They were prepared by the Italian expert Sandro Necchi. The new version 8 cannot be called revolutionary. It looks and feels the same as the last version. All will depend if it plays any stronger than that. M-Chess Pro. 8.0 is a DOS program written by Marty Hirsch in Assembler and C language. It includes a lot of chess knowledge and it has been developped to simulate the human style of play as much as possible. I mean that the program will take more risks trying to win all games rather than just playing on the opponents mistakes. The opening book is also simulating the humans chess players as much as possible with deep knowledge on selected variations. The available moves choise selection is quite wide to alternate the play. It includes a unique book learning feature that allows the program to increase and modify it's opening book. All this makes M-Chess Pro. program quite strong and fun to play. Winner of the 9th WMCCC and the 9th IPCCC 2000 in Paderborn! Shredder has started in 1995 as a project at university. Good tournament and test results encouraged me to spend more work in it and lead to the winning of the 1996 WMCCC in Jakarta. Shredder has been commercially available since then and continued to perform very well in computer chess championships. It was 3rd in Paris 1997 and managed to finish as the runner up in the blitz championship there. Shredder is written in ANSI-C and therefore it can easily compiled on various hardware platforms. WCHESS is written by Dave Kittinger known from the famous Constellation table top computer. The Constellation was the first program that was able to understand the Bh7+ sacrifice and solve the KBNK mate. WChess received world-wide attention after it scored 5 out of 6 against some of the strongest American grandmasters in the Intel Harvard Cup Man v Machine tournament held in October 1994. The program consolidated its position as one of the top micro-computer chess programs by winning the 1994 Uniform Platform Computer Chess Tournament held in London. WChess uses an iterative, depth first alpha-beta search with forward pruning and a tactical swap-off evaluation to limit the growth of the search tree. The evaluator is somewhat primitive and is not currently as dynamic as the author would like. Positional information is communicated to the search mainly by piece value tables. The current version of the program only implements end game databases for KPK although the author is looking into adding more databases. Wchess is also available as Power Chess distributed by Sierra. NOVAG the home of Kittinger's table top computers.